My brother loves those Limited Edition Oreos. I love making cupcakes. Thus, I made him these last fall. 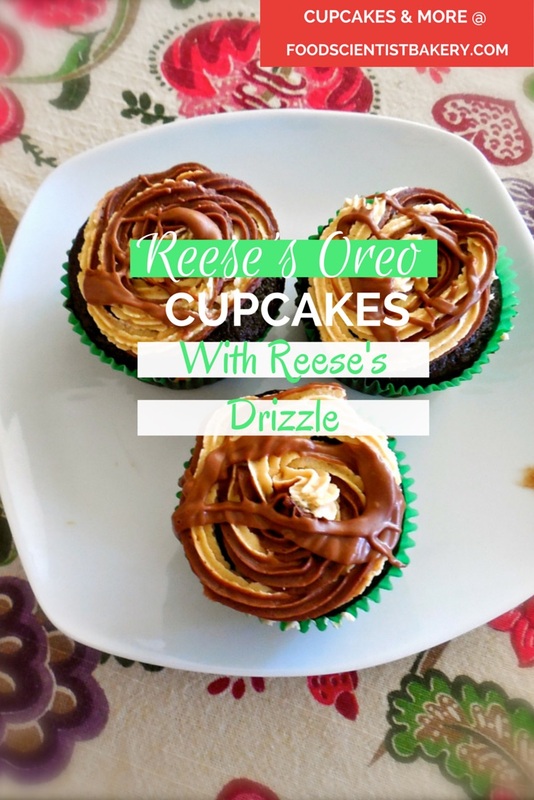 They’re not overly sweet or rich, just tasty little peanut butter Oreo cupcakes! Chocolate cupcake with Reese’s pieces and chopped Oreos, filling made with Reese’s Oreo filling and cream cheese, chocolate and peanut butter frosting swirled (tricky), and melted Reese’s drizzled on top. Preheat oven to 350˚ F. Line cupcake pan with paper liners. In bowl of an electric mixer combine flour, sugar, cocoa powder, baking soda, and baking powder. Mix on low speed to blend. Add oil, buttermilk, coffee, eggs, and vanilla to the bowl and mix on low speed until well blended and completely incorporated. Mix in Reese’s Pieces and Oreo chunks. Fill liners ¾ way for high-rise cupcakes. Bake 20-25 minutes, or until a toothpick inserted in the center comes out clean. Let cupcakes cool in the pans about 15 minutes, then move to wire rack and allow to cool completely. Blend and use to fill cupcakes, use the cone method: cut a cone from the middle of the cupcakes. Fill and replace cone. Mix up the frostings by combing all ingredients and blending well. Using one pastry bag, fill one side with chocolate frosting and the other side with peanut butter frosting. Pipe until you see both frosting coming out. Frost cupcakes. Melt Reese’s cups and drizzle on top. Shovel into mouth.